Visitor pre-registration is a feature available in SwipedOn that allows you to create a visitor in anticipation of their expected visit. The visitor will need to be pre-registered from the SwipedOn web dashboard by a company admin or location manager, before the visitor arriving, allowing for a quicker sign in on arrival. Once you are logged into your dashboard, click on the 'Pre-Registration' tab. You will immediately notice that the Pre-Registration page is divided into two sections: 'Pre-registered Visitors' on the left and 'Add New Visitor' to the right. When configuring pre-registered visitors, the Full Name and Visitor Field Two are required fields, any other fields are optional. *Please note, if your company has defined two locations i.e. Building 1 and Building 2 and an employee named John Smith is assigned to Building 2, selecting Building 2 in the Locations list will only display John Smith, he will not appear in the Building 1 employee list. It is good to be aware that any visitor field customisation that is created, within the 'Visitor Fields' section, will also become available for pre-registered visitors. 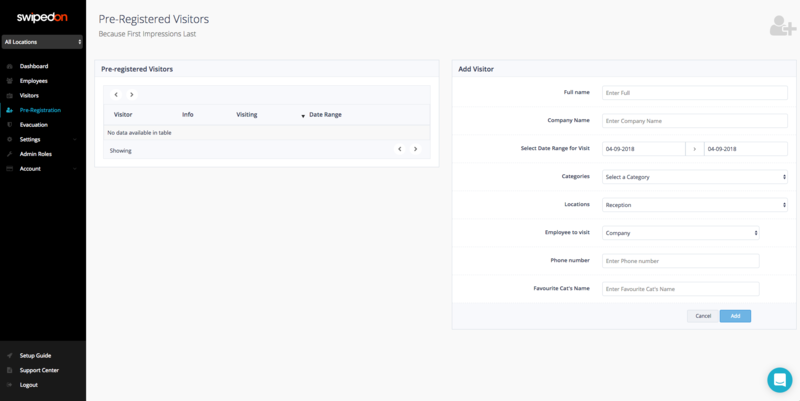 In the image below, a custom field and a visitor category have been created within the 'Visitor Fields' section of the dashboard. 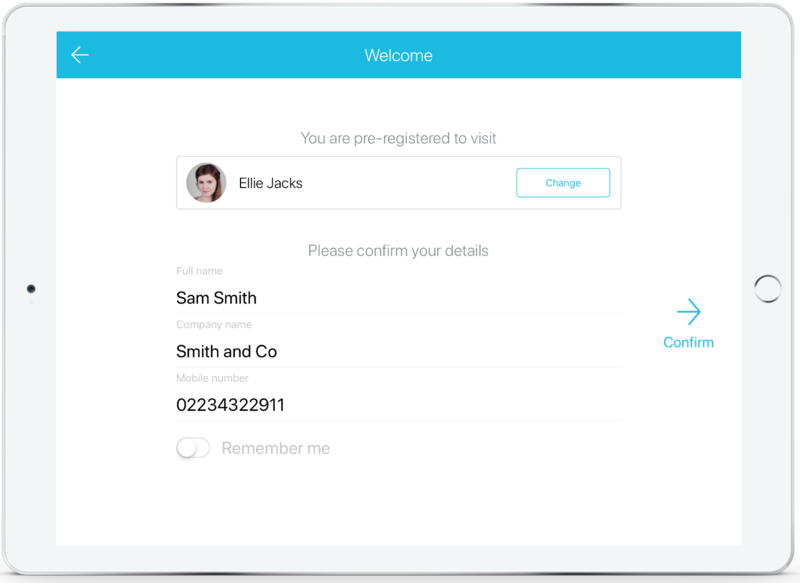 After the pre-registered visitor has been created on the dashboard, they will be able to sign into the SwipedOn application on your iPad when they arrive by tapping on the 'Visitor In' button and inputting their name, the below screen will then appear. *Please note, if 'Auto suggest' is disabled the visitor will need to input their full name, the same that was input when they were pre-registered from the SwipedOn web dashboard. 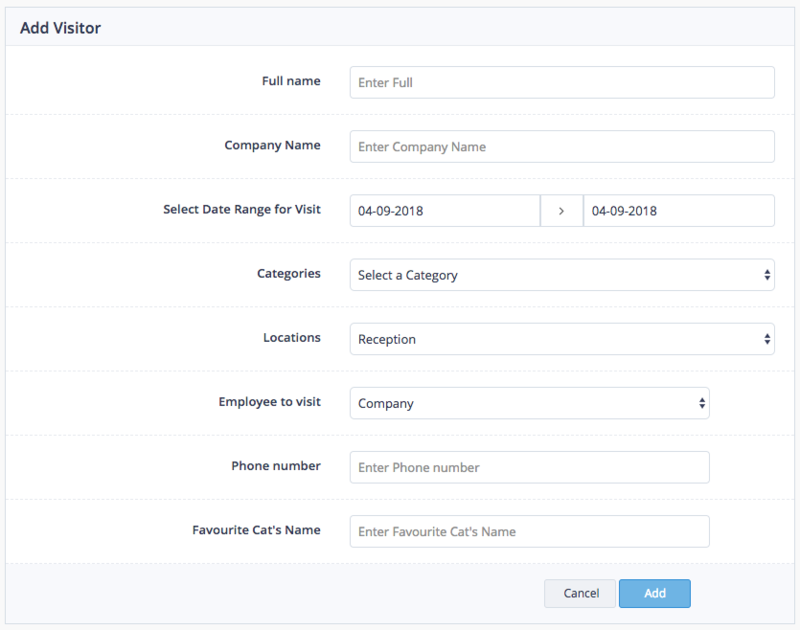 Once the visitor has input and selected their name from the pre-registered visitors list, their visitors details will be automatically populated showing those details that were input when the visitor was pre-registered. The visitor then taps 'Confirm' and continues through the remainder of the sign in process that has been implemented. 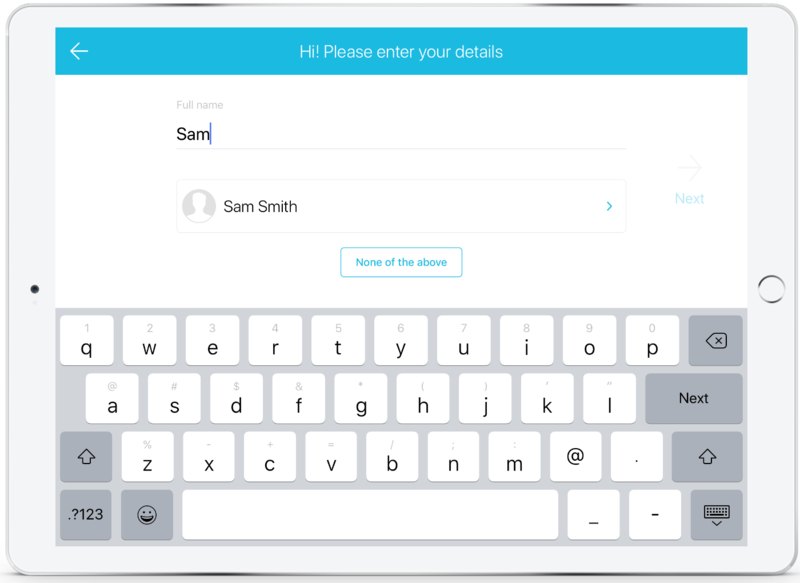 *Please note, to shorten the sign in process as shown above, enable 'auto suggest' so when the third character of the visitors name is input on the iPad, their details appear for them to tap and automatically populate their name along with the visitor field two.